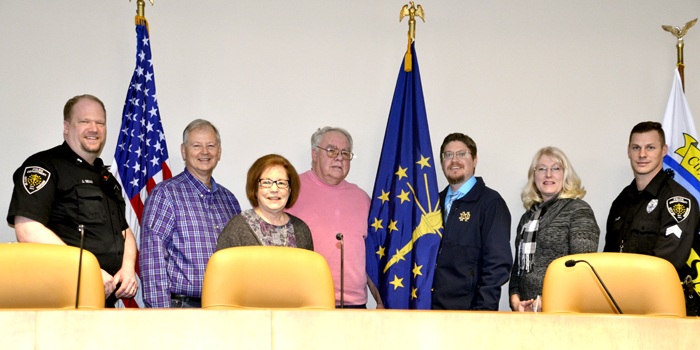 Pictured, from left, Warsaw Police Captain Joel Beam, Jack Wilhite, Cindy Dobbins, Commission President Steve Foster, Warsaw City Planner Jeremy Skinner, Connie Fribley, Warsaw Police Sgt. Lewis Fuller. WARSAW — Concerns related to Glad Street, Winona Avenue, Herscher Drive and Country Club Road were addressed at the Warsaw Traffic Safety Commission meeting held Wednesday, Feb. 6. Warsaw Police Captain Beam said he has received complaints stating that when school lets out, people are turning on Glad Street, then going up to Husky Trail and blocking the intersection. Traffic Commission President Steve Foster did a check of this area and reported he did not see more than two vehicles sitting at the roundabout. “The times I was there, both morning and afternoon, there were never more than two cars at the roundabout,” said Foster. Another complaint received in connection to that area is that vehicles are not stopping at Glad and Flora streets. Beam said this was checked out, with the discovery that there is some validity to this concern. Police were also notified of problems with vehicles speeding on Winona Avenue near South Columbia Street. This was investigated and speed was not found to be an issue in that area. Beam acknowledged there will always be drivers speeding but said overall speed is not an issue in that area. Speeding concerns were also reported on Herscher Drive where the speed limit is 30 mph. Beam said after checking into this, they discovered that the average speed on Herscher Drive was 19 mph. Complaints regarding speeding on Country Club Road were found to be valid, with Beam advising the speed limit will be enforced. Foster also addressed an issue that was brought up by Warsaw resident Kim Hart at the October meeting. Hart shared concerns regarding Main and Bronson streets, stating that a picket fence in that area impairs the ability of drivers to see oncoming traffic. Hart said she felt it was a safety concern for young children walking home from school as well as for future bike lanes. Foster spent time observing the area. Regarding traffic control in annexed areas, Foster stated this will need to be an ongoing project. A draft will be put together and sent to the city attorney for an ordinance at later date. The Warsaw Traffic Safety Commission is re-examining the speed limit for CR 200N and possibly others within newly annexed areas to ensure that they more appropriately comply with existing city ordinances. Beam was elected to serve as the 2019 traffic safety commission secretary. Foster will follow up with Warsaw Public Works Superintendent Jeff Beeler about the 25 mph speed limit sign on Market Street, which needs to be changed to 30 mph. The next regular meeting will be held at 1 p.m. Wednesday, March 6.